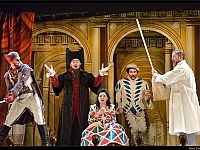 Rossini's beloved opera about the valet Figaro who manages to arrange everything his master asks for, comes to the stage in a new production that combines commedia del'arte style with the fast life style of the 21st century. *** A pre-performance lecture (in Hebrew) is held one hour before every performance. Free admission for tickets holders. With his band of hired musicians, Count Almaviva comes at dawn to serenade Rosina outside the house of her guardian, Dr. Bartolo, who keeps her a virtual prisoner in his house in the hope of marrying her himself. When Rosina does not appear, Almaviva dismisses the musicians but lingers near the house. 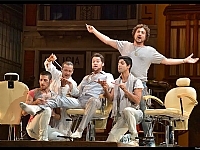 The barber Figaro arrives and describes his busy life. The Count asks him to arrange a meeting with Rosina, adding that his identity must not be known for he does not wish her to be influenced by his rank. Suddenly Rosina appears on her balcony, joined by Dr. Bartolo. The Count and Figaro hide, but Rosina manages to drop a note to the Count. 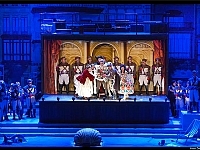 After Bartolo leaves, Almaviva sings a second serenade telling Rosina that he is Lindoro, a poor student who can offer her nothing but his love. The Count and Figaro continue their planning. They hear that troops are entering the city, and they decide that Almaviva, disguised as a drunken officer, will try to arrange to be billeted with Bartolo. Rosina, alone in the house, expresses her spirited nature. 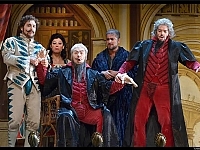 Bartolo returns and is soon visited by Don Basilio, the music teacher, who informs him that Count Almaviva has arrived in town and both suspect that he is the mysterious stranger who is trying to woo Rosina. Basilio suggests that they start a campaign of slander which will make Rosina reject the Count. Figaro overhears their plan, returns to warn Rosina of the doctor’s intention to marry her, and leaves with a note from her to “Lindoro”. Dr. Bartolo suspects that Figaro may be carrying messages between his ward and her admirer, but is frustrated by Rosina in his attempts to learn the truth. Later the Count enters in disguise and the doctor suspiciously resists the order to quarter the soldier. During the confusion created by the Count in the Bartolo household, he manages to pass a note to Rosina which Bartolo intercepts, but which Rosina cleverly switches with the week’s laundry list. Soon soldiers arrive to arrest the offender but immediately release him when the Count reveals his true identity. The doctor, wondering if the drunken soldier may not be an emissary of Count Almaviva, is visited by a stranger, none other than the Count himself disguised as a music teacher named Don Alonso. He explains that Basilio is ill and he has come instead to give Rosina her music lesson. Figaro arrives, and to assure the young couple a quiet moment together, insists on shaving the doctor. Suddenly Basilio appears - in perfect health. He is soon convinced that he is really not well and is rushed out of the house. 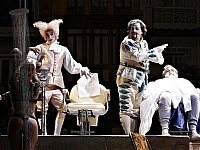 Figaro proceeds with the shaving of the doctor while the two lovers plan their escape. Bartolo overhears them and, more suspicious than ever, chases both the Count and Figaro out of the house. As night falls, the Count (Lindoro), accompanied by Figaro, places a ladder against Rosina’s balcony. Rosina, believing the slanderous tales about her suitor that Bartolo has told her, refuses to go with them. The Count reveals his identity to her and then they prepare to leave. Suddenly they discover that the ladder is no longer there. At the same moment Don Basilio and the notary arrive prepared to marry Bartolo to his ward. Instead, Figaro and the Count persuade the notary to marry the Count to Rosina. Arriving too late to stop the wedding, Dr. Bartolo accepts his misfortune gracefully and all offer their congratulations to the Count and his new Countess. A 30 minute pre-performance lecture (in hebrew) takes place at the auditorium one hour before each performance.